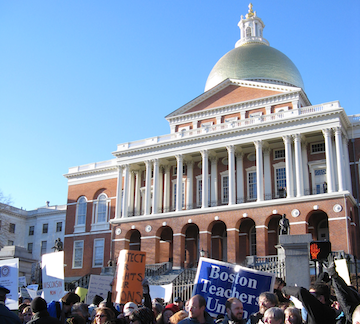 Please join us in support of legislation that would prevent over one billion dollars in budget cuts in Massachusetts. WHEN: Thursday, May 5, 2011, 10:00 a.m. – 3:00 p.m.
An Act to Invest in Our Communities is a legislative proposal that would increase taxes on only the most financially well-off households, raising $1.2 billion in additional revenue to plug a significant portion of our state's $2 billion budget shortfall. We can’t cut our way out of this deficit. We need continued investments in our schools, our children and our communities to rebuild our economy. This will require new revenue – raised in the fairest way possible – that will help maintain essential public services relied on by all Massachusetts residents. A broad and diverse statewide coalition is working together to pass An Act to Invest in Our Communities. Hundreds of supporters are expected to fill the Gardner Auditorium hearing room on May 5, and we hope you'll be there with us. Say thanks or boo to the author.